Did you check those "translations" you received from those "online translation agencies" claiming that they have 15000 (updated to 25000 in 2 years, well, they can never surprise us) certified translators? They don't have any shame to tell this, but if you were an insider like me, you would know that they have only 1-2 real translators in every language pair, and the rest is, 15000 (updated to 25000) attacking, slandering, desperate jobless people and students acting as translators. Who made those fake translators certified? The fake translation agency itself. How? By requiring a payment of 1 USD through PayPal when they register. To check if they are real humans or bots. That's it. This is what it takes to be a certified translator at that fake agency. Nobody checks if those people are real translators or not. No reference, CV or diploma check, no nothing, except a 1 USD payment to prove that those people are human. I know this very well, because I was a victim of this requirement. Even though I was a seasoned translator, I could not register their website for 1 year. Because, I was not able to use PayPal at that time and I had to wait until they offer registration through Payoneer Debit Card. Can you see the irony here? During that one year, founders of that fake agency sent many emails to me, begging me to register. However, although I told the problem to them, they did not solve this simple problem, but instead, they kept sending me their emails. This should be a warning sign to me. A complete nonsense right from their start. Talking about their start, maybe I better add, they started that business with only a Wordpress website template they bought for 24 USD. This is what it takes to be an innovator in their desperate world. 5 years later and after claiming that they have already 15000 certified translators, they implemented a small test (a text taken from wikipedia !?!? ), but who will check that test? Their previously registered fake translators. Yes, you heard it right, and they translate "Test your aim" in a shooting game as "Test your purpose", they translate "Shot of fresh strawberries" in a photography related text as "Drink fresh strawberry juice". Because, forget about about an education related with Translation, they do not have a proper basic foreign language education. They do not know meanings of even very simple words. They just look up some online dictionaries and select a meaning there randomly as you can see from the examples. One of the typical mistakes of these fake translators is, they can not understand the difference between a noun and a verb. For example, they translate "Power-ups" in a game as "Open" (verb). For God's sake, how can this be a verb? Then, what is the difference between them and Google Translate and why do you have to pay for a meaningless fake translation? More shockingly, one can easily say that these people could not have a proper basic education at all, because they use literally street language in all their "translations". Can you imagine translation of your company contracts in pure street language and with a randomly selected meaningless mix of words? Being a Native Speaker is very important for those fake online translation agencies, is not it? They wrote pages of articles about "importance of being native" on their blogs, like they know everything. Well, these are their Native "translators". However, when it comes to review, these fake translators always find imaginary mistakes in our professional translations, they always lie and attack us, simply because they can not understand what is written in that source text, simply because they do not have any other way to earn money (they are not qualified for anything) and simply because they do not have any ethics. Can you imagine, a biology student is being used by that fake translation agency as a professional translator in 31 language pairs? For God's sake, he is not even a translator in one language pair, he is a biology student, how come they can tell all their clients that he is a professional translator in 31 language pairs, and how come they can give most of the translation projects to him? That university student should be the new Einstein and he should be hired by top corporations of the world with those 31 language pairs. He is not the only example, all their fake translators are like this. What else can we expect from an agency whose founder proudly tells everybody that he has a MBA in Business from a highly respected Business School located in France, although he does not have a BA, or any academic background? Do you know what did he do before he opened that fake online translation agency? He opened a Medical Company in Cardiology field, again without knowing anything about Cardiology. When someone asks, he answers: "We Israeli entrepreneurs just open businesses without thinking and talking about them". Can you see the danger here? Can you see their problematic mindset? No wonder the people they hire are just like them. They found their perfect match. But, how about their unfortunate clients? Nobody thinks about them. This is why our translation market is totally ruined today. They ruined the whole market. However, you are paying hundreds (if not thousands) of Dollars to these fake translators (New Einsteins of Today) at those fake online translation agencies without really knowing what you receive in return. Fake online translation agencies sell fake products, meaning, they sell fake and irrelevant translations. When someone sells a fake product, there is a term for this in the law. This is called fraud. How many thousands of fake products did they sell in 8 years? How much fraudulent money did they grab and who will stop them? The thing is, we the real translators, the real owners of translation market, we think and think and think and wait for years until we decide we are finally ready to open a translation agency, although we have an education to do this business and tens of years of 24/7 experience experience in this business. But, the ones who do not know anything about translation and what is worse, the ones who do not talk or think anything before opening a business, come out of nowhere, they open their fake agencies in a snap, and they ruin whole market without caring for anything. They know they don't really belong to translation market, but they are acting. They are great pretenders, impostors. They don't care anything about translation, clients, translators and the market. This is their one shot to make money in their desperate world. When we try to tell these mistakes to founders, to management of these fake translation agencies, they send insulting, disrespectful replies to us, then, they continue as usual with these fake translators. Rather than taking some measures against these fake translators, they promote them, they give more work to them and they let them attack us more. They can not accept that they are actually using fake translators although we explain these to them over and over again with hundreds of pages of proofreadings of their unacceptable translations. Why? Because, if they accept this fact, this will also mean that they scammed thousands of clients in 8 years. Management of these fake agencies punish professional translators, because we revealed that they are actually using fake translators. They fight with us for hours, and then, they hack our computers even while we translate their own projects with very tight deadlines (1 hour). They freeze our computers making them totally unusable. This did not happen only one time. This is their standard procedure to silence real translators. Do you think a real translation agency can hack their translators' computers in the middle of their own translation projects? What kind of people can possibly do such a thing? We are trying very hard to complete their project on time, but they are very busy with fighting with us and hacking our computers. What do we suppose to do at that time? Protect our computers or try to complete their projects? They are doing these because they are not a real translation agency and they do not have any ethics and any sense to say the least. Do you know that I had to cover my laptops' cameras with some paper to avoid them watching my house live all day long, for 5 years for God's sake? Because, we have to log into their website and stay like that all day long, staring at our screens to be able to get some projects, racing against thousands of desperate fake translators to click those projects before them so that we can get a project out of their mercy. And, as long as we log into their system (through their website or through their browser add-on), they can learn our IP addresses and they can do whatever they want with our computers by using their required desktop browser add-on. There is no escape from that. As you can see from their hacking behavior I mentioned above, they are actually doing whatever they want. Their official android mobile application and official desktop browser add-on were requiring us to grant all access permissions, what is more, there was a spy malware in their desktop browser add-on. Why do you think a translation agency requires Camera, SD card, Contacts, etc., all possible access permissions to install their android application? The answer is very simple: For spying everything about us and about our businesses. Founder of that fake translation agency also tells everybody that he was a consultant in a network and software security company called "Check Point" ("ZoneAlarm"). Now, how about that? Do you wonder what did they consult to him? Founders and management of these fake online translation agencies hate real translators, because real translators know that everything about them is a lie and that they are the Hoax of this Century. So, the unbelievable mobbing, disrespect, both from management and from those slandering, attacking, desperate thousands of fake translators continue. Desperate newbie Web Developers / Entrepreneurs / Innovators met desperate jobless people in the net. This is a deadly combination that can ruin everything you can think of just for the sake of money. Here is the result of their latest collaboration: a totally ruined translation market and a totally ruined translation profession. Their utter ignorance has been terrorizing whole online and offline world for years, but for them, ignorance is bliss. This is the so called Start-up Generation / Nation you have been hearing all the time. I have many screenshots and I will share them with you, you can be sure of this, but for now, please check those "translations" you received from them, before it is too late. I am a Real and Professional Translator. This is my profession and this is my market. Well, this ought to be my market, but now it is occupied and polluted with hundreds of fake online translation agencies and with their thousands of fake internet translators announced as Certified, Professional, Expert, Platinum, Gold, Silver, Bronze "translators", Language Leaders, Reviewers, Proofreaders who are actually nothing more than a human version of Google Translate. Believe me, Google Translate translates better than them. I reviewed all their translations. At least, Google Translate is not an impostor, it is what it is. It is not fooling anybody by telling that it is the Leading Professional Translation Agency. What is more, it is free, it is not grabbing fraudulent monies from thousands of unaware clients (as opposed to what those fake online translation agencies always do). Thousands of attacking, slandering, desperate jobless people and students acting as translators. Been there, witnessed that in a very painful way. I will tell more about these later on for sure. Another shocking thing is, some Capital Investment companies unfortunately fell into their traps and supported these Internet Scams by entering into partnerships and funding them. I translated documents for Finance World for a quarter of a century and I thought they were different. And now, after their name is disclosed by many victims (clients and translators), they began to multiply themselves. They opened an additional enterprise version of their scheme. They are targeting especially US markets with that new version, however, with same management and with same fake translators. Nothing has changed, they only added the word "Enterprise" to short form of their "company" name. They perfectly know where the money is, right? Now, what can we expect from US markets after these fake translations pour into them? You already know the answer, but let me highlight it one more time. Do they care what will happen to US markets? 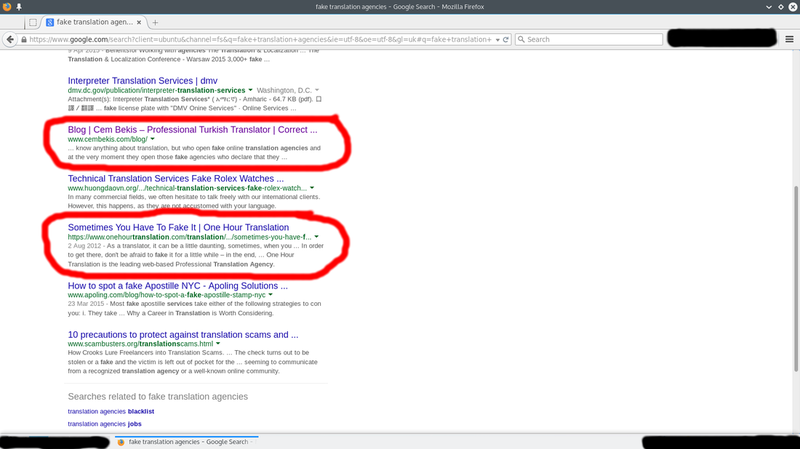 You can see these fake translation agencies on first pages of Google search results, starting from the very first result, occupying at least first 20 pages. Unfortunately, they are even chosen as the official translation agencies by Google for localization of apps and games on Google Play. This is why apps and games on Google Play have terrible localizations now. To further understand the reliability level of search results, let's look into another market and another online scam. Although it is an ongoing scam for years, Binary Options/Forex scam is exposed in Finance Market only two weeks ago. The scam comes from the very same geographic location, from the very same Start-up Generation/Nation. And again, those fraudulent Binary Options/Forex websites are on first pages of Google search results, starting from the very first result. And guess who translated websites and all documents of those fraudulent Binary Option/Forex businesses? Their comrade Fake Online Translation agencies. At this point, please remember what CEO of one of those Fake Online Translation Agencies publicly tells: "We Israeli entrepreneurs just open businesses without thinking or talking about them". This explains only a part of the story. There is another, even more scandalous outcome of this intimacy between Scam Binary Option/Forex websites and Scam/Fake Online Translation Agencies and this will help you to see who they really are. After translating all those Scam Binary/Forex Websites, owners of Fake Translation Agencies opened their own Scam Binary Option/Forex businesses using the private information they gained during the translation process. They do not care anything as long as they find a new way to scam people. And, to perform their scams, they do not hesitate to break all rules of business by even using the private information they gained while serving their clients, in this case, other online scammers. Sky is the limit for their love for scam, they open fake online translation agencies today, they open scam binary options websites tomorrow and next day they learn about online adult dating scam websites during the translation process and they open online adult dating scam websites, and the other day they learn and perform another new scam. They spy on their own clients to have more scam expertise. There is no limit to their scam. This is their logic, this is their character. And they call this; hi-tech, they call this; entrepreneurship, they call this; innovation... They are nothing but scam. No wonder we can not appear in Google search results while the scam translation agencies we are fighting against are on the first pages of Google search results and while they are the chosen translation agencies for localization of apps and games on Google Play. They do not let us appear in search results, because they do not want us to expose their scam to public. They do not want us to tell the truth. For example, CEO of the Largest Web-Based, Famous, Market Leader, but Fake Translation Agency (with 15.000 semi-duty fake translators under the hood) is craving to grab Billions of US Dollars worth US Military/Pentagon translation bids, although he, founders of the company (or rather say website) and their financial supporters are not US citizens. They just use a virtual office address in New York as their fake headquarters for 10 years for 50 USD/month. But, who knows? They are the chosen ones. Can you imagine what would happen in the USA because of translation mistakes? Just dig a little in and see who wins Government bids and who are behind them. They don't belong to translation market, they don't know anything about translation. Don't get fooled by all the glitters and lies they display on their websites. They use everything to hide the garbage, the monkey business going on behind the scenes. Where is translation market now? Is there any translation market left thanks to these criminals? We will not stop. We will expose all of them. We will clean our market no matter what. To support our movement against translation scams, and these criminals, please spread the word and keep visiting our website for updates and more info. ​Google should not be so intimate with scam agencies/companies in every market. Because, they have all the information, vast sources of information in their hands and they could see very easily with whom they are being so intimate. All these affects overall reliability of Google essentially. Please visit my website later again, because this is just a humble start. There is much more to come, with many screenshots. You do not belong to Translation Market, and more important, you do not belong to a civilized world. Therefore, we will send you back where you came from. You ruined our Translation Market, and now, we the real translators, we will give you what you deserved. "Whatsoever a man soweth, that shall he also reap". You looked at that email signature for years, but you could not understand anything, could you? Maybe you need a translation? Go ahead and jump if you want a total bankruptcy and humiliation at the end. The big cleaning in Translation Market has just begun. Please get in touch, we will be more than glad to have you with us. And, please spread the word. We are more strong together. We will clean this market.